Leveling Mounts | Cal Fasteners, Inc. Leveling mounts are another popular product supplied by Cal Fasteners, Inc. We carry a wide range of products to offer leveling or mobility with just about any type of constructed base. Use our leveling mounts for easy set-up, even when installing in the field. Some of Cal Fasteners’ leveling mounts are especially useful in low-profile applications. Cal Fasteners carries levelers in many different sizes, with a wide range of base diameters. We also offer various materials, for both the studs and the bases. Some have special finishes or plating, or added features such as grip ridges along the outside. Our nylon-based levelers are offered in various sizes, with hex or bottom Phillips slots, and our low-profile levelers come in a wide range of dimensions. CFI also carries vinyl-based levelers, aluminum-based swivel levelers, slotted swivel levelers, low-profile swivel levelers, levelers with wrench flats, extended hex levelers, glides and swivel glides. CFI carries top end hex broaches, for adjusting from above with a socket or wrench. We also supply other related parts, such as crutch tip glides, which are typically made from rubber and used with other molded components such as bumpers. In addition, Cal Fasteners distributes stainless steel casters. These come in different sizes, with swivel or rigid plates. The wheels themselves can be made from a number of varied materials, depending on the most important characteristics, such as durability, skid-resistance, or heat- or cold-tolerance. 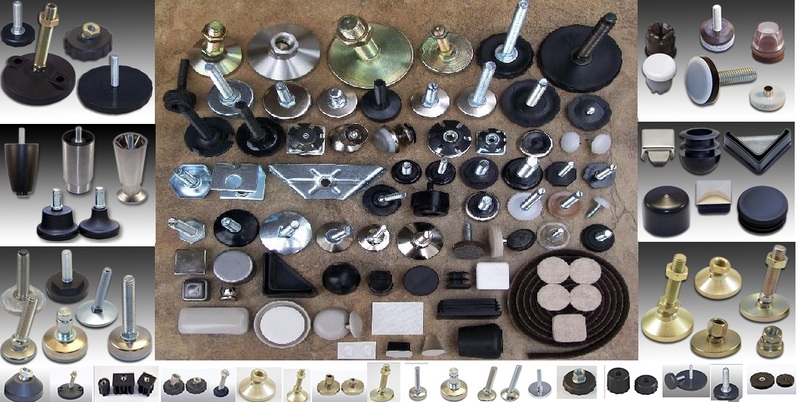 Other related products include swivel-type chair and furniture glides, support and corner brackets, threaded inserts, tube connectors, and nickel-plated spring caps. Cal Fasteners’ leveling mounts come in a wide range of sizes and styles. CFI offers different materials, coatings, and platings, as well as metric sizing. We have several thread sizes for each base size. The features include everything from swivels to non-skid coatings to brightly colored finishes. With more options and lower costs, Cal Fasteners is the obvious choice for leveling mounts.